Broadcast Live HDMI & YPbPr Video as Cable TV & IPTV Channels. 2 slot design ? Other Video Inputs cards available ?Hot swappable - SDI Card, YpbPr Card. 4 crystal clear video streams up to 1080p60 each. Bitrate is fully adjustable from 1.5 - 19 Mbps, and a variety of audio codecs are available. 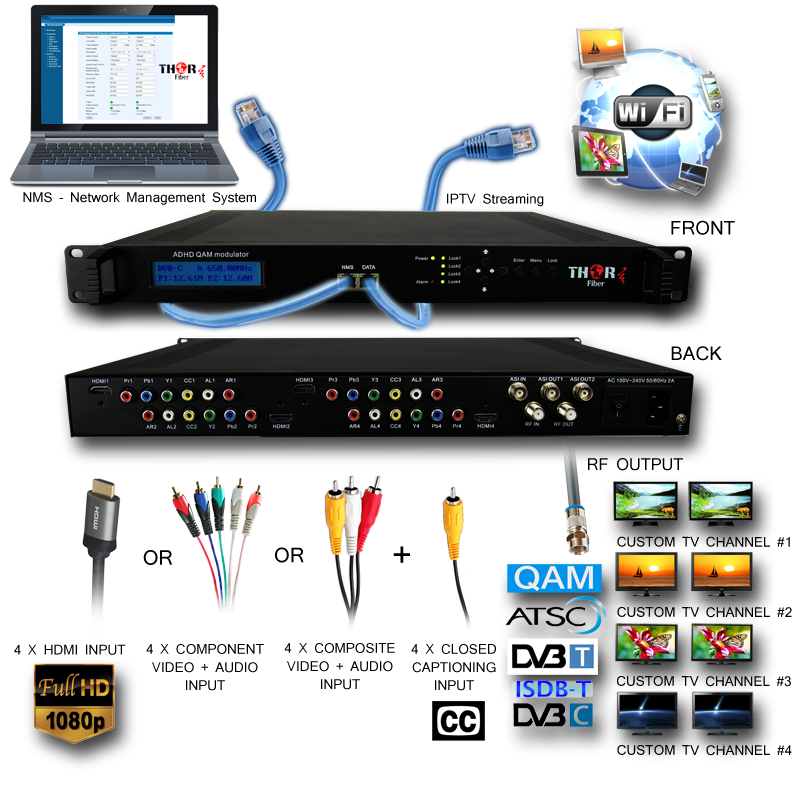 Standard audio encoding in MPEG-2 AAC and MPEG-4 AAC are provided, as well as a licensed Dolby AC/3 audio codec. Audio sources can be selected from either embedded HDMI, Analog RCA, or Digital Optical TosLink ports. For Surround sound, digital audio inputs can be set to "pass through" mode to preserve 5.1 and 7.1 audio that is encoded already in Dolby compatible format. Two mirrored ASI outputs are provided for broadcasters for added flexibly in distributing the content generated by the 4 encoders. Programs input via ASI can also be multiplexed and remapped to the ASI output, adding yet another function to the unit as an ASI multiplexer. IPTV is not neglected in any way. All four encoded programs can be mapped to unique IP address outputs and ports in either UDP or RTP format. The IP output can be configured to strip null packets to reduce network bandwidth, or preserve the constant bit rat (CBR) packet stuffing normally preferred by television systems. All four channels can be independently configured for either multicast or unicast outputs. Closed captioning is supported on a dedicated analog 608 CC port with RCA connector, an industry standard for line 21 captioning systems. Any 720 or 1080 line standard video signal in either HDMI or Component YPbPr format can be used for each of the four channels. Just like all other professional Thor modulator chassis, this system can be configured with firmware for either QAM, DVB-C, DVB-T, or ATSC channel format output.